Review by Krulle on 11/11/2013. The bonus situation is horrible. Only Greece, Karthago, and Rome are relevant bonuses, and due to size, only the Greece-bonuses will give you a real advantage to win. 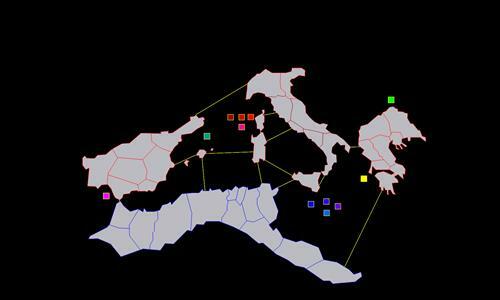 Instead of adding size bonus for more territories to the Rome/Carthage groupings, make own bonuses of the "add-ons". E.g. make Iberia a bonus by itself. This map needs smaller (meaning fewer territories) bonus areas. The bonus values are also wildly distorted. Playing the default setting, whoever gains control of Greece can pretty much faceroll to victory. Review by graze on 11/7/2013. Also, there is historical inaccuracy. During the 1st punic war, Carthage couldn't rule middle Iberian peninsula. Hamilcar Barca, general of Carthage conquered middle Iberian after the 1st war. Different map, not having every territory was a definite twist, but alright to play.